HAL uses signals from your brain and autonomous functionality to provide strength and stability. 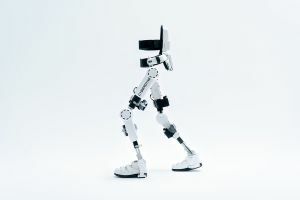 Japanese robotics company Cyberdyne has officially received approval from the Food and Drug Administration (FDA) to make its lower-body exoskeleton, known as Hybrid Assisted Limb or HAL, available to U.S. patients. The exoskeleton, which would be available through licensed medical facilities only, uses sensors to detect bioelectric signals sent from your brain to your muscles, which it pairs with your movement (or intended movement) in order to increase strength and stability. The approved version of HAL is known as HAL for Medical Use and was designed primarily for people with lower limb disabilities, and can help restore mobility and independence. What sets HAL apart from other exoskeleton technologies that are currently available is that instead of using physical walking motions, it uses both voluntary movement and autonomous functionality. In other words, the exoskeleton works with the bioelectric signals of the wearer’s nervous system to “know” when and how to move. HAL has been shown to be especially helpful for people with lower-limb disabilities, as many of these conditions involve a disconnect between the person’s intentions to move (the signals the brain sends) and the actual muscle movement that follows — or, more often, doesn’t follow. The exoskeleton also supports itself while being worn, meaning there’s no added weight or stress on the wearer’s body while they’re operating it. In the next few months, HAL’s U.S. debut will be at a cybernetic treatment center set to open in Jacksonville, Florida. For now, only the medical version of HAL will be officially available to patients. If the non-medical version is approved in the United States, however, the exoskeleton (and the added strength it provides) could become available to anyone.